Craig Cook rides for Workington. Peterborough Panthers team boss Carl Johnson reckons one of the top meetings of 2017 is in prospect tonight (May 29). Panthers entertain Workington in an SGB Championship clash at the East of England Arena (7pm) and Johnson says it is not a night to be missed. Not only will major signing Chris Harris make his Peterborough debut following his capture late last week, he will be joined in the home septet by the man he replaces as number one. Jack Holder will race for Panthers after it had initially been thought he would line up for his SGB Premiership club, Poole. But because the Pirates’ top-flight clash against Wolverhampton is a rearranged fixture, Panthers’ meeting takes priority. And if that’s not enough to whet the appetite, there’s also the presence of Peterborough’s star rider of 2016, Craig Cook, spearheading the visiting Comets. “All the ingredients are there for a brilliant recipe,” said Johnson. “I’ve got a feeling this is going to be a night of speedway to remember. “We could not be more excited about pulling off the signing of Chris and we can’t wait to see him racing for Peterborough again. “It’s also a huge boost to have Jack available. We were initially under the impression that he would be riding for Poole, but due to their fixture being a rearranged one, we’re able to use him. “It’s vital we start to address our poor run of late by picking up a win to get us moving in the right direction again. “There’s no denying we’ve had a really tough time of late with injuries and defeats. We always stress that we’re one big family, and we all need to stick together to turn our form around. 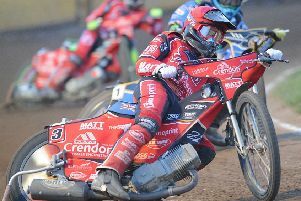 Three-time British champion Harris will made a dash from Leicester, where he rides for SGB Premiership club Rye House earlier in the day, to race for Panthers. Any Rockets fans keen on making the same trip will be warmly welcomed at the East of England Arena! Peterborough have also placed on record their thanks to Ben Barker, who had been lined up to fill in for Holder, but is now not required. They do still call on one guest as exciting Edinburgh man Josh Pickering steps in for Bradley Wilson-Dean, who does race for his top-flight side, Swindon. Peterborough remain eighth in the SGB Championship standings after four successive defeats, while visitors Workington are fifth and would climb into the play-off places with a positive result at the East of England Arena. PETERBOROUGH: Tom Bacon, Chris Harris, Jack Holder, Simon Lambert, Ulrich Ostergaard, Josh Pickering (guest), Paul Starke. WORKINGTON: Mason Campton, Craig Cook, Thomas Jorgensen, Ty Proctor, James Sarjeant, Matt Williamson, Tom Woolley (guest).